By now we all know about the Starbuck’s Puppucinno and you probably know of at least a few locations in your hometown, like the ice cream or cupcake cake place, that provide freebies or small bites to the fur kids. 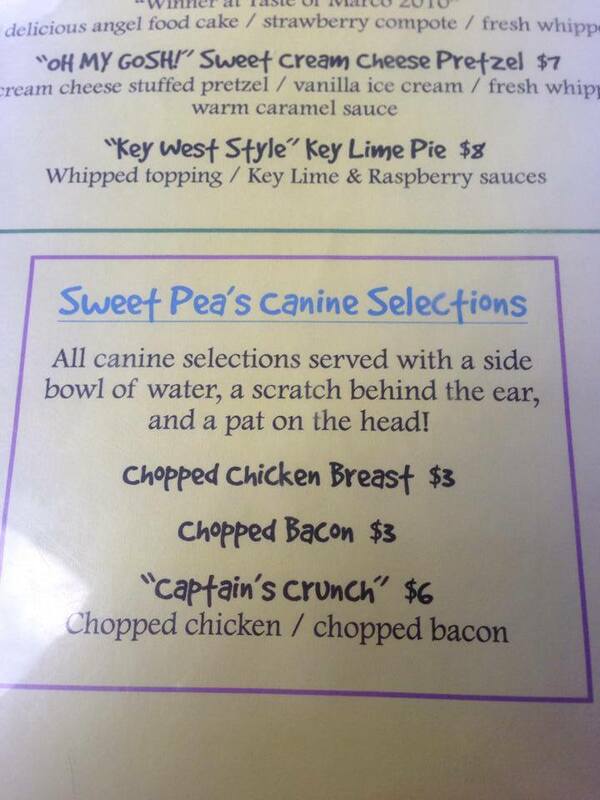 However, as the canine catering trend continues, many sit-down restaurants are not only allowing pooches on their patios, they’re creating specialty menus specifically designed for our four-legged dining companions. From coast to coast, here a few restaurants you might want to check out on your next doggie date night. Located at the Inn By the Sea on a one-mile stretch of sand, Sea Glass offers panoramic views of Crescent Beach. In either the Sea Glass lounge or on the outdoor patio, you can enjoy fresh from the ocean fare while your sandy-pawed pooch noshes on Meat “Roaff” with natural ground beef, steamed rice, and raw veggies. *Please note that dogs are NOT allowed on the beach April-October. Located in the Capital Hill District with a James Beard award-winning chef at the helm, you’re sure to find something to please both you and your dog. Check out the Pooch Patio Menu that features, among other things, Bowser Beer (non-alcoholic, of course) and Beef Tips in rich sauce with rice. Recommended to us by locals when we were visiting the Naples Botanical Garden, Mango’s is a bustling little place overlooking Smokehouse Bay. With everything from live entertainment to a nightly sushi bar and a fantastic brunch, you can dine on the patio with your dog anytime. 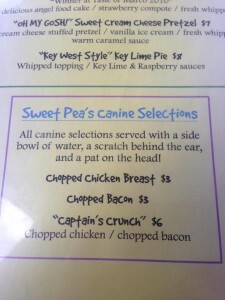 Check out Sweet Pea’s Canine Selections served with a fresh bowl of water and complimentary scratchies. Henri suggests the Captain’s Crunch with extra bacon, and I loved their signature French toast, a Cuban bread battered in cornflakes and almonds then topped with strawberries and bananas. With every kind of sausage imaginable, this is a meat intensive place. And we aren’t complaining. Wash it down with one of over 100 beers, or if you’re having breakfast, go for the ManMosa. For your pooch, try the Bow Wow Boudin with pork, chicken liver, rice and veggies. After over-indulging, you can (let your dog) run it off at the off-leash dog park located just beyond the outdoor table area. Classic cool Austin. Classic dog-friendly. About 45 minutes from Chicago is the historic town of Lockport. There, the Public Landing welcomes “all well behaved pooches” on their 40-seat patio. Yappetizers are served in a collectible Public Landing frisbee, and the menu has all the meat things a finicky dog could want. It’s a little cold in Lockport in February, but check them out when their patio re-opens in May. Weather permitting, of course. I’m always appreciative of restaurants that advertise when kids eat free. Those are the nights I go elsewhere. 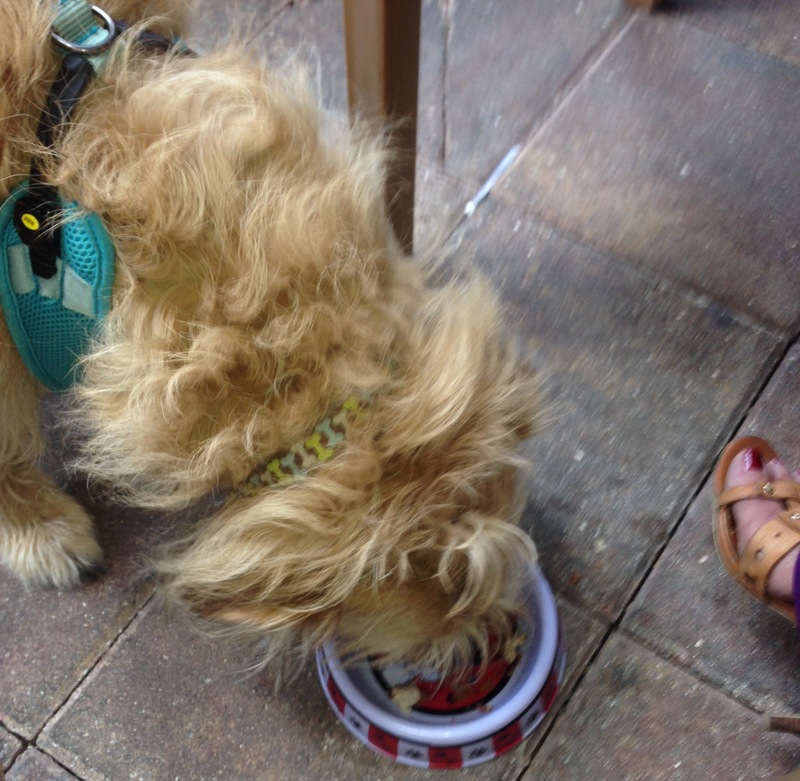 At Tin Shed, Tuesday is Doggie Love Night and DOGS eat free. Additionally, any time a dog comes to dinner wearing his Tin Shed bandana (proceeds from purchase benefiting the Pixie Project) he gets half off his meal. 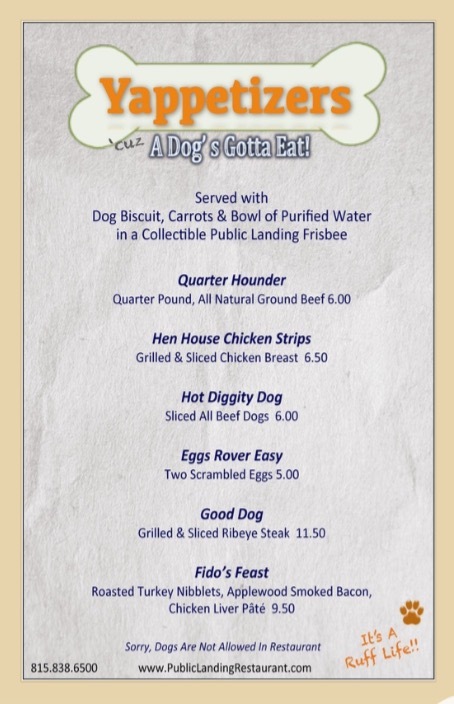 Order Fido Food with your choice of chicken, ground beef, or pork mixed with rice or sweet potatoes. You can even share the people approved peanut butter and banana ice cream for dessert. Thanks, Tin Shed. You understand me. We know there are a lot of restaurants welcoming furry guests with more than just a bowl of water and pat on the head. SHARE your favorite place and meal time suggestions with us in the comments, so we know where to go if we’re ever in your neck of the woods. Hi —Many thanks for including Inn by the Sea in your facebook post on pet travel- greatly appreciated! 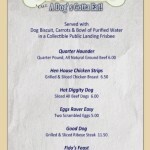 Love the pics of the dog menus! Great post! Thanks for compiling such an informative post. I love going out to eat and if there is a chance I can take my dog with me then that’ll be awesome! The pictures of dog food menus are also greatly appreciated. Cheers! There are SO many dog-friendly places that welcome our pups. It’s probably time for an undated list featuring some new places. Thanks for reading. BONE Appetit!